As an OEM, you build the equipment that powers jobsites around the world, agriculture production and much more, so you need a power and engineering partner to help you deliver on your promise of quality. Perkins Pacific engineers are well versed in the entire Perkins engine product line and can offer valuable insight on product features, performance and integration – ensuring superior machinery design and enhancing value for your end users. As a tight-knit, in-house team, Perkins Pacific engineers are dedicated to understanding your entire product line, its specifications and applications. Our application engineering process is meticulously detailed and we work with you every step of the way. Beginning at initial setup and analysis of EMR 4 functionality, Perkins Pacific engineers provide drawings, 3D CAD modeling and consultation during product prototyping – ensuring a cost efficient progression into later design stages. Before testing an engine in the field, Perkins Pacific engineers thoroughly analyze and optimize the engine using a CAD system that verifies both the engine and the emission system prior to installation. OEM’s power systems are only as good as the sum of their parts, and an engine must fit perfectly to optimize machinery operation. Perkins Pacific’s application experts are skilled in engineering application-specific solutions for thousands of pieces of equipment and know precisely what Perkins engines need to operate at maximum performance. Armed with a broad knowledge and vast parts inventory, these engineers provide valuable consultation on product feature enhancements and are knowledgeable about Tier 4 Final engine integration complexities. Perkins Pacific engineering guidance doesn’t end when the engine leaves the manufacturing facility: our engineering support then evolves to work in the field. Assisting in on site testing and adoption, Perkins Pacific engineers work with OEMs throughout the application process and ensure that engine integration is complete. But integration is only half the battle. Perkins Pacific engineers evaluate the performance of your engine and tweak and adjust in order to properly construct the high efficiency engine that OEM’s require. 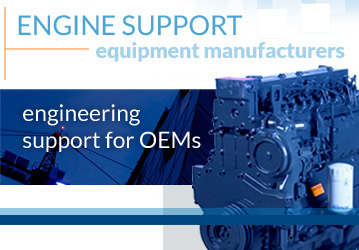 To learn more about Perkins engine support for OEMs, visit our support page to learn how we can support your engine.